Last week I was at London’s Digital Catapult centre, building on the discussion we started with the thinkathon in Winchester. This time round, we wanted to bring in some other voices from outside the academic sector, so I invited Lindsey Green from Frankly Green and Webb, and Kevin Bacon from who I met when he organised a fun workshop for the heritage sector. We also had Jake Berger from the BBC, David Tarrant from the Open Data Institute and Nigel Smith from FutureLearn. Graeme, Adam and Elenora were also there of course, as where Bryan and John from we are open. Graeme started the day while we awaited all the delegates, by explaining at little bit about the Portus archaeology project, and how virtual access to a (until recently at least) mostly closed site had been enabled though through things like the MOOC, a relativity new on-line tour, a BBC/Discovery Channel TV documentary and open publishing of some academic papers. The opportunity, he said, was linking these and more resources, so an interest sparked by one could be satisfied by others. Then everyone had the opportunity to introduce themselves and explain a little bit about what they hoped to get out of the day. One of the most exciting things I learned here was RES, Jake Berger’s project which the BBC has been surprisingly quiet about. This little video explains it better than I can. We attempted to run the session a bit like the earlier thinkthon, but its interesting to note that with more people, it didn’t work quite as well. In Winchester, with a smaller group, the We Are Open guys nudged our discussion to explore interesting avenues more deeply. But with this larger group Bryan ended up drawing and drawing trying (and sometimes failing) to keep up, and not contributing as much as he was able to do in Winchester. Graeme compensated by taking more of a “chair” role than he had needed to do during the Thinkathon, but I think in the end the discussion was shallower. But new concepts reached more minds in the larger group, so I hope we may have scattered some seeds that will bare fruit in future. We started talking about MOOCs and the Portus FutureLearn. Though an open course, some hoops have to jumped through to make the content open, and in fact not all the content is open, student’s own comments are considered their copyright by default, for example, so they can only be seen by other students. One of the advantages of massively open courses is the broad range of students they attract, with different backgrounds and levels of expertise. They may well being to the course, though a comment a unique insight which no-one had considered before of real value, not just to fellow students, but to the academics behind the course. But that insight can’t be shared from within the course. Permission must the sought from the student. Some contributions are made using other platforms. 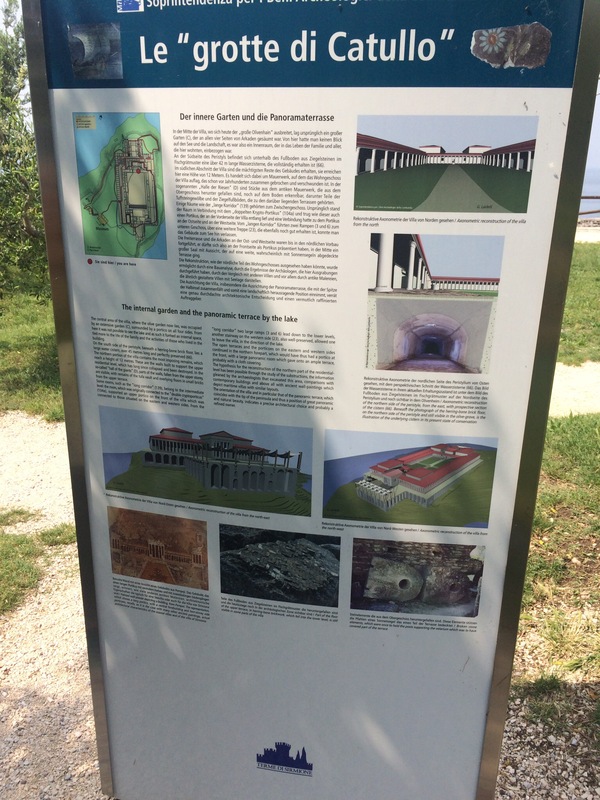 For example, in the Portus MOOC students were asked to submit diagrams and photos on Flikr. On upload Flikr allows the user to set the level of open access to the file, but the user can’t change that after the original decision, and the default, is copyright, all rights reserved. So despite the various levels of Creative Commons protection offered by other options, most of the material uploaded in this manner is also closed, not open. We talked a little about incentive’s for users to consider Creative Commons when they share their work. I don’t think the open badges idea that we talked about quite a lot at Winchester was specifically mentioned here, but on reflection I think its bubbling under. 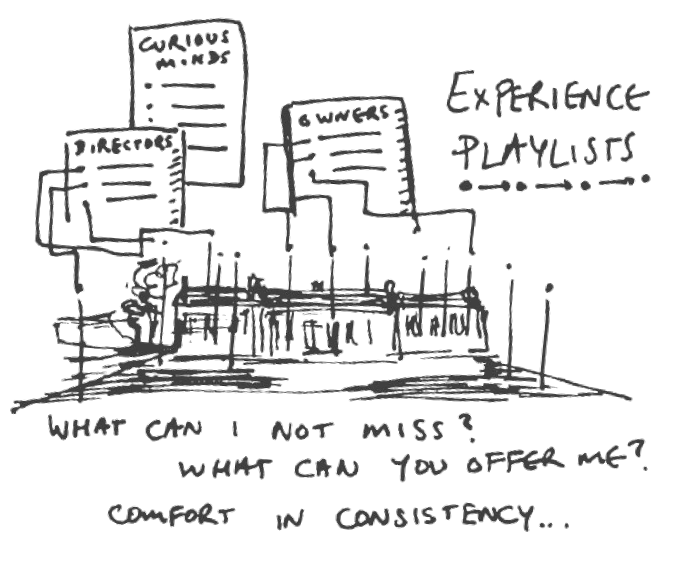 For example, we returned to the idea of Experience Playlists. The idea of leaving a trail of breadcrumbs across digital and possibly even realworld platforms is attractive. Not just for the trailblazer to look back on, but for other users to follow. But should it be more explicit than, say, Amazon telling us “people who bought this also bought these” or Google ranking popular links? Could an open badge system residing in the background on people’s phone discreetly create a visit timeline, like the one I left at SF MOMA? Then we tackled Heritage Organisations’ different understanding (fear?) of what Open means. Different laws pertain in different states for a start, so organisations ability to make stuff open could be limited by the state in which they operate. Then there is the issue of willingness, not just of heritage organisations – for example, a museum might own the physical artifact of a contemporary painting, but not its Intellectual Property, of which the artist (or their estate) might retain control. Then when the museum is the outright owner of a work, they may fear that opening up access to its reproduction limits the ability to generate much needed funds. Though, as Lindsey pointed out, in the Netherlands, the Rijksmuseum may have shown other institutions the way in that regard. Personally I came out of the discussion no less convinced that a Creative Commons, share alike, non-commercial proposition is something that heritage organisations should proactively embrace. We had a go at working out what we might learn from Citizen Science projects, but by this time, I think we were all getting tired, and I’m not sure we came out with any useful conclusions. My own notes get scrappy here, but I do remember pointing out the critical-mass challenge for public participation in heritage, which has dogged crowdsourcing heritage projects like History Pin. A week or two back, I had an interesting conversation with my supervisor, which I didn’t think I should mention on-line until, today, he invoked the “inverse fight club rule”. So I can now reveal that P.O.R.T.U.S stands for Portus Open Research Technologies User Study – yes, I know, as Graeme said “recursive-acronym-me-up baby.” This isn’t the Portus Project, but but it does ride on the back of that work, and (we hope) it will also work to the Portus Project’s benefit. P.O.R.T.U.S is a small pilot project to explore better signposting to open research, so (for example) people interested in the BBC Documentary Rome’s Lost Empire, (which coincidentally is repeated TONIGHT folks, hence my urgency in getting this post out) might find their way to the Portus Project website, the FutureLearn MOOC, the plethora of academics papers available free through ePrints (this one for example) or even raw data. Though the pilot project will use the Portus Project itself as a test bed, we’re keen to apply the learning to Cultural Heritage of all types. To which end I’m looking to organise a workshop bringing together cultural heritage organisations, the commercial companies that build interpretation and learning for them, and open source data providers like universities. What are the creative digital business (particularly but not exclusively in cultural heritage context) opportunities provided by aligning diverse open scholarship information? Does the pilot implementation of this for the Portus Project offer anything to creative digital businesses? The budget for this pilot project is small, and that means the workshop will have limited places, but if you are working with digital engagement, at or for cultural heritage sites and museums,. and would like to attend, drop me a note in the comments. I can’t stop fiddling. I spent most of today back on LDD recreating the Grandi Magazzini components, to take account of the lessons I learned with the actual Lego model. I also changed the Gothic arch on the reverse, and added some roofing (omitting the ridge tiles, which are not available on Lego’s pick-a-brick service). Here’s a picture of what a few components look like, when put together to make part of the central range of the full building. The scary thing is, now I’ve got a definitive version, using only bricks I can order from Lego, I can find out actually how much the whole thing might cost. Just the three roofed two story “units” in that picture would cost almost £90, plus postage. Based on those costs – the whole thing could be more than £1,250. Too rich for my blood. Yesterday, I got the Lego bricks I’d ordered last week. So I set about building, to see if I’d got my LDD (Lego Digital Designer) design right. After I’d ordered them, I’d already spotted a few bricks I hadn’t put into the LLD model, and thus weren’t on my order list. But I was disappointed to that there were a a number of pieces – the corner tiles, the 1×4 bricks – that I’d entirely missed when I was ordering. So I had to raid my boys collection – luckily he had plenty of the right sort of bricks, plus some others (tiles especially) that weren’t available from Lego’s brick order service. so what I’ve ended up with isn’t exactly the model I designed. In the building of it, I discovered weaknesses in the construction – for example, the solid wall can be pushed down off the model too easily when fixing the upper story onto the ground floor. But of course, the advantage of work with your hands, building with bricks instead of of bits, is that structural improvements are somehow more immediately apparent. The concept of learning styles has been pretty effectively debunked over the last few years, but there does remain the idea that you can learn about different things in different ways. My hands could “see” the model better than my eyes looking at the computer model. One thing I wanted to check that I’d found very difficult to measure was the height of the two units stacked on top of each other. The archaeological evidence suggests the brick walls of the building were 11 metres high (the roof of course was higher still). Using my rudimentary 1 stud = 1 metre scale, my model should stand 11 studs high. Measuring height is very difficult in LDD, because one standard brick is more than one stud high, and especially because the LLD environment does not come with a vertical scale. 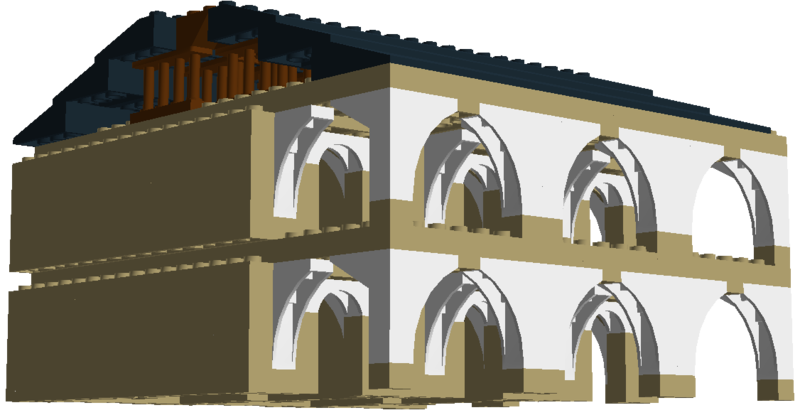 Comparing my model with other CAD models of the building, it looks shorter, more squat, less elegant than the CAD ones. However, I was please to see that, when measured with a twelve stud tile, my physical model is just about eleven studs high. So I’m going to deconstruct the model and rebuild it, physically and in LDD, with the bricks beside my screen. My aim is to make it stronger, and use less bricks. I’m not sure we are going to be able to build an entire model during the Festival of Archaeology (especially at standard list prices), but I still want to build the most efficient, model I can. Which I’m sure was the aim of the Roman builders of the Grandi Magazzini, nigh-on a couple of millennia ago. Yesterday I returned to the Lego model of the Grandi Magazzini, that I was building in Lego Digital Designer last year. We’ve got an idea to do a day of modelling during the upcoming 25th Festival of Archaeology. Obviously, we’ll cover the “proper” modelling (CGI and 3D printing for example) as well as Lego, but I thought it would be fun to enable every visitor to the department to make at least one of the “warehouse units” and, over the course of the open day, build up more and more towards the complete Grandi Magazzini. But to do that, I need to redesign my model. Not all the pieces I used in Lego Digital Designer are actually available. For example, my first model made extensive use of a “BRICK WITH BOW 1x6x2” arch, which isn’t currently available – but more on that later. I needed to redesign the model using only bricks (and colours) that are available on Lego’s pick-a-brick custom order service. But not only that, I wanted to make it slightly easier to build physically – my previous model would not have allowed for building a single unit and then plugging it on to the main model, at least not without some deconstruction. I alos wanted to use fewer bricks. They are not cheap on the pick-a-brick service. With those three aims, I set about remaking the model, sticking as much as possible to the dimensions of my previous attempt which, a little bit through judgement, but also with a lot of luck, just about managed to keep to the one stud per metre scale I’d decided upon. 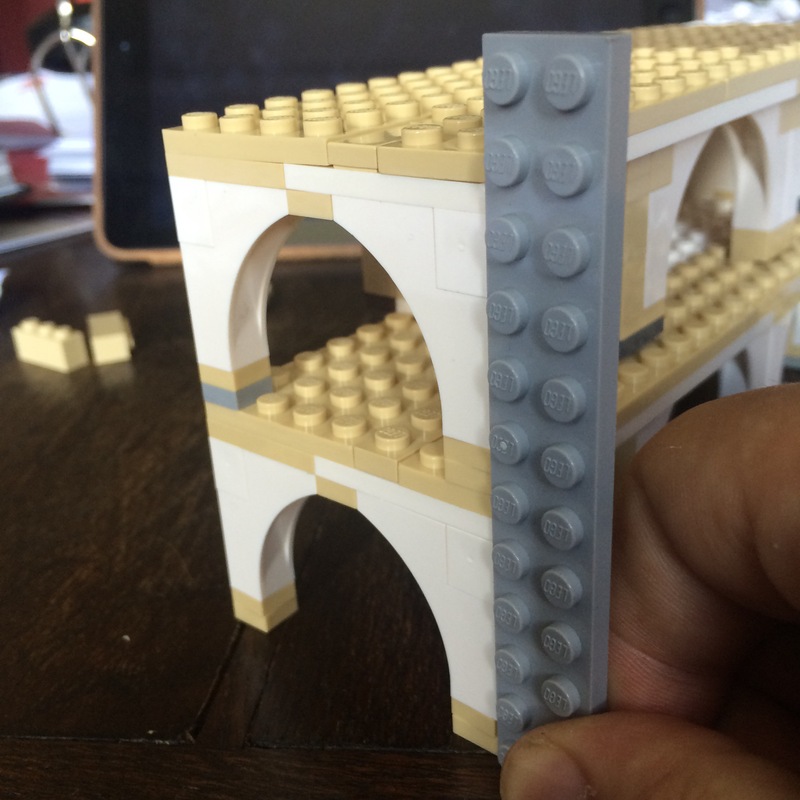 I lost some of the detail in the bricks I couldn’t use, but the most missed brick was the BRICK WITH BOW 1x6x2, which was a lovely Romaneque arch. I had to replace it, in most places with two half-arches. In some places it actually worked better the arches of each floor’s colonnade are now closer to the 5.2 metre width that the evidence points to. The 1x6x2 brick restricted each opening to a width of just four metres. Inside though, the “vaulting” on the rearmost room looks distinctly “gothic”. I decided I could live with that, but the same thing happens on top floor of the rear external walls. Those half-arch bricks are relatively efficient, cost-wise, so I’ve retained them on that rear wall for the time being. But I fear their impact in multiplicity, across the exterior might give the wrong impression, it might make the building look like a monastery, more ecclesiastical than mercantile. Its funny isn’t when visualizing something, how you have to be aware of the interpretations that people bring with them to the visualisation. If people had never seen gothic architecture, I might be happier to leave these arches as they are. But I have another idea involving a shallower arch, which while still not “Roman” in shape, may be less of a compromise. This solution will look more 19th century industrial, but perhaps that “industrial” interpretation is closer to what we think was the original use of the building. Right now though, I’m leaving it as is. Its time to move away from the computer and the theory, and try to build what I’ve designed in real life. So I’ve ordered the required bricks from Lego (for £25 including postage) and when they arrive I’ll see how easy it is for my boy (our target market for this I’m sure) to put together. and the Bithynian fields, seeing you in safety. we rest in the bed we longed for? This one moment’s worth all the labour. with whatever of laughter lives here. Last week, the family and I took a break in Italy. We stayed on the shores of Lake Garda, and the first thing we did, was visit one of the most important cultural attractions of the Lake, GardaLand. But the very next day, we went to the southern peninsular, Sirmione. At the very tip of this rocky finger which, on the map at least, seems to command views right up to the Northern end of the lake, lie ancient Roman ruins. They are misnamed. 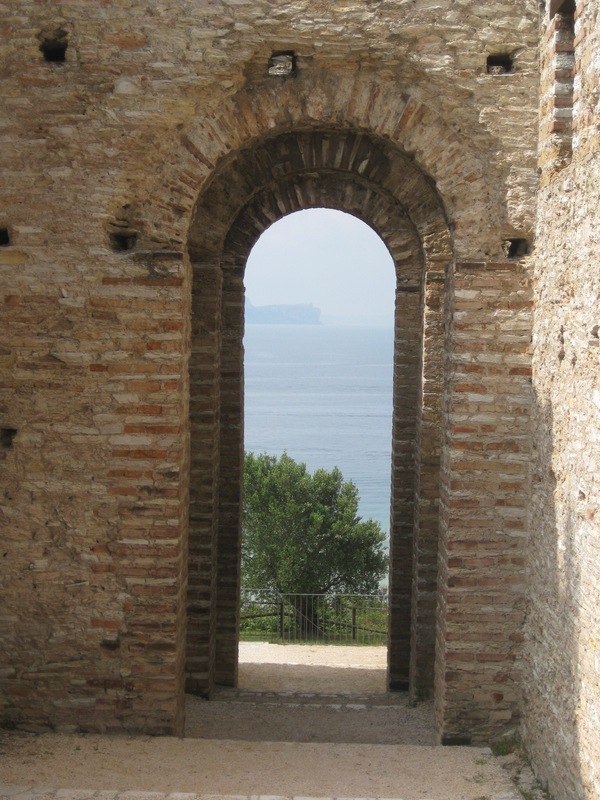 Known, since the eighteenth century at least, as the Grotte di Catullo, most of the visible ruins date from long after that pre-Christian poet died. But as his poem (above) evidences, he did once live on the peninsular, and regard it as his home. And there is evidence of another, older, villa upon which the buildings that these ruins describe was built. The scale of the place is fascinating. 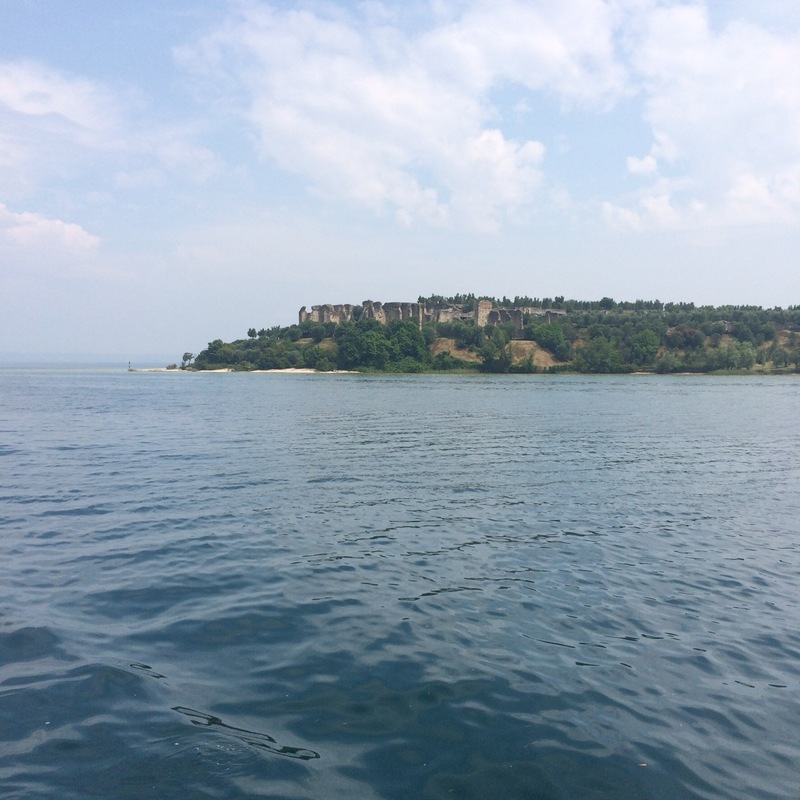 We arrived on the ferry from Peschiera del Garda, which is the very best way to arrive because it showcases the ruins as the ferry rounds the tip of the peninsular. From the water, the great brick and stone arches (which, if I read the interpretation correctly, comprise just the footings and undercroft of the villa) look huge. Their presence alone makes the massive scale of building five at Portus less surprising. You mind yourself thinking, as your boat chugs round to the dock, that this could not be some private villa, but surely, such an impressive building, which such a commanding view of the lake, must have had some sort of governmental purpose? The modelled illustrations on the interpretation boards play up the that sense of scale. And on a hot day (like the day of our visit) you wonder if you really want to take the walk from one end to the other. But then, you are surprised by the compactness of the site. Or at least I was. While walking among the pillars and columns, I was still impressed and overwhelmed by their height, but walking between them, traversing the site, across its width and length, and domestic scale reasserted itself, and yes, you can believe it might have been a villa (all-be-it an impressive one). My computer doesn’t even think “axiality” is a word at all, but I think I understand. The problem is, if I understand at all, its only because I’ve been hanging around with archaeologists quite a lot recently. And I don’t think this is a problem of poor translation from the Italian – the less jargon-y text is translated perfectly well. I think its evidence that the interpretation project could have benefited with a storyteller on the team. A couple of weeks back, I read about “the rise of emotional agents” in the Guardian. One of the games mentioned was Blood and Laurels, a work of interactive fiction (or if you like) a text-based adventure set in ancient Rome. Which seems appropriate as the Portus Project MOOC is running again. That’s said, I’m not convinced its a Rome historians will recognise, the Emperor is “Princeps” which is a pretty generic term, and his predecessor is a fellow called Corretius. Princeps is I think meant to be Nero, which would make Corretius, Claudius. I think I understand reason for the changes – this way, you won’t be tempted to think the the outcome of the interactive fiction is pre-determined by actual history. I’ve played it through a couple of times now. The first time, as I would any adventure, putting myself into the role and turning out to be a slightly cowardly poet, who just wants everyone to be his friend and not to kill him. Turns out I’m not the only one. I’ve just finished a second playthrough, wherein I tried to be more brash, braver, and a bit of flirt. I should stick to what I know, because this time the story ended prematurely with my character scared in bed. Not quite the satisfying ending of the previous attempt, in which I became Emperor. I’ll try again, and this time, try to make enemies and see how long I survive. There’s a lot to read on the Versu site, including this paper, which is the clearest description of how the whole thing works. I’m wondering whether this or possibly Inform 7, from another member of the Versu team, might have an application in cultural heritage sites. It feels like I’ve spent the best part of four days learning Linux. Lets be specific (because I’ve discovered, you have to be specific), I’ve been learning the RedHat distro of Linux which does somethings differently to, for example, Ubunto. Oh, and I’ve been learning the Windows Command prompt syntax as well, all to get a Minecraft Portus up on to the University’s Minecraft server. As an arty-farty type who, after some BASIC in my schooldays, has been pretty exclusively a Mac user, my command line experience has seen me many times looking up into the afterlife whispering prayers of thanks to Saint Steve of Jobs. It was he who, in nicking the idea for a GUI (and drag-and-drop – oh all hail drag-and-drop!) from Xerox, saved most of us from the Hell of mis-typed commands and open source syntax (where for example, some commands use “-r” as an option to make the command recursive and other commands, quite arbitrarily it seems, scorn the lower case and only understand “-R” do do exactly the same thing). The first day’s frustrations were all about getting the user permissions I needed to start tinkering. Some things worked, but other things were forbidden, and of course in my innocence I thought I was doing something wrong until I finally returned to the support line to find the administrator had mis-typed something in setting up my permissions. So what is it exactly? Well, its the work of a group of Shawn Graham’s students “3rd year undergrad history class, but […] a mix of majors; none of them ancient historians” Shawn explained to me. According to their presentation, the intention was to recreate the life of a slave in Portus, by limiting the interactivity. I’m not sure whether that side of it is actually working in my version, as I seem to be be able to explore with complete freedom. The model itself is based on these old archaeological (or maybe more appropriately, antiquarian) plans, most specifically the ones by Canina. It looks pretty good even without the Romecraft texture pack, which the students used (and which I’ll install when my head stops hurting). The server isn’t publicly available currently, but if you have a University of Southampton username, open a VPN with the university, fire up your copy of Minecraft, click on multiplayer, and seek out this world, which goes under the name of svr00978.soton.ac.uk. It’s also worth checking out Shawn’s assignment to his students which, explains why they worked so hard to create this. I’ve been toying with Twine . Not like a cat with wool, you understand (though maybe like a cat with wool, because I find it very difficult to leave it alone now I’ve started), but with an open-source tool for telling interactive, nonlinear stories. 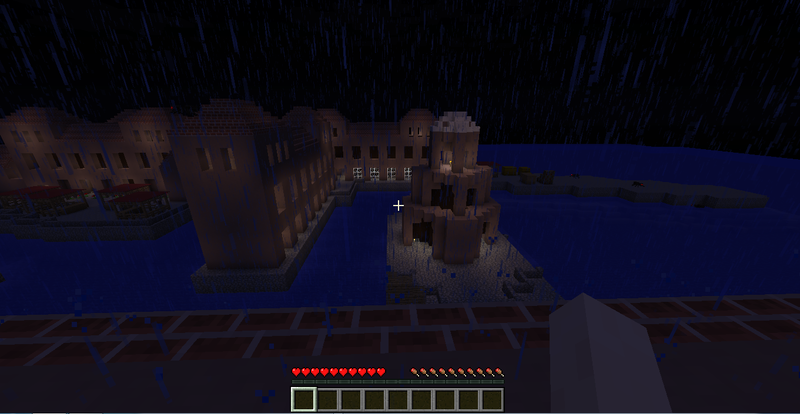 I’m thinking about using it to create an interactive narrative based around Portus. Inspired by the Honda Type R interactive YouTube ad, I have this idea about the user being able to flick between the present day and one or more periods of the port’s Roman development and decline, while they also get the better idea of how the various spaces connect and relate to one-another. I also have this crazy idea about using it to navigate other student’s creative course work. Which is all very ambitious for someone who knows very little at Twine. 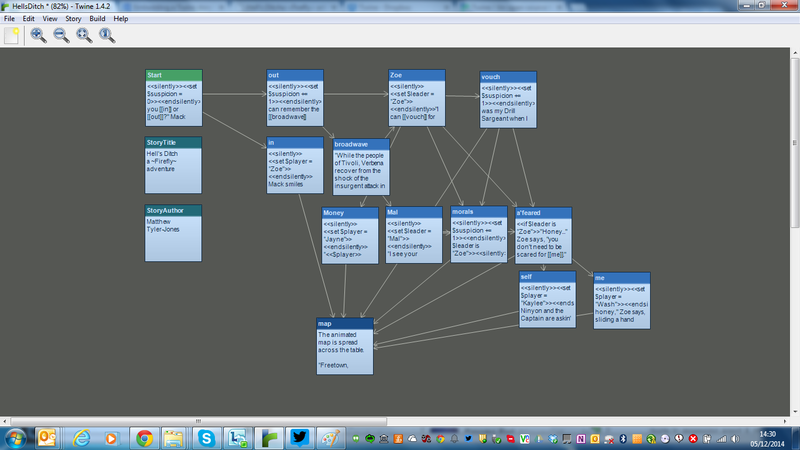 So this week I’ve been learning about Twine. And the best way to learn about it is to play with it. And its fun. It is so much better than HypeDyn, which has a very similar model. It’s so much more intuitive, easier to use and, dammit, prettier. It may turn out not to be quite as functional at HypeDyn, but so far, everything I’ve asked of it has (with only a little Googleing for help) been as easy as pie. What I haven’t yet fully scoped is how procedural it might be. On the surface, it seems everything the player reads has to be written, though it can be shaped at least by variables “if/else” functions. So, given that I needed to have a structure, a story, in mind to get the most out of my practice, I haven’t started with the Portus Twine. Instead I’ve used a story that I’ve had knowing about in my brain for quite a while. Its a piece of “fanfic” if you will, a story featuring the characters from the little known (but much loved) short-lived TV series, Firefly. Its a story that I’ve told interactively before (frequently in fact), around a table using a variety of Roleplaying Game systems. Players of all sorts have made all sorts of choices, so while I can’t claim to be able to predict everything a player might want to do, I do have a good understanding of the choices they usually want to make. I’ve also discovered that the story can have a number of different, yet satisfying, endings and got a good idea of how the emotional ups and downs of the story feature in the narrative. I’ve not done it all of course, just the first scene. But I have managed to do something I’ve been wanting to try for some time, and that is let the player’s actions decide who their character is, and thus what their point of view will be for the rest of the story. It’s only a short scene (very short if you are a gung-ho sort of player who jumps in with both feet). Short enough in fact to try multiple times to see who you end up as. Give it a go. tell me what you think of my first attempt. If you’d like to have a go yourself, this a very easy and useful introduction, and this is a very snazzy presentation. It is notably how the award winning game Depression Quest was created. 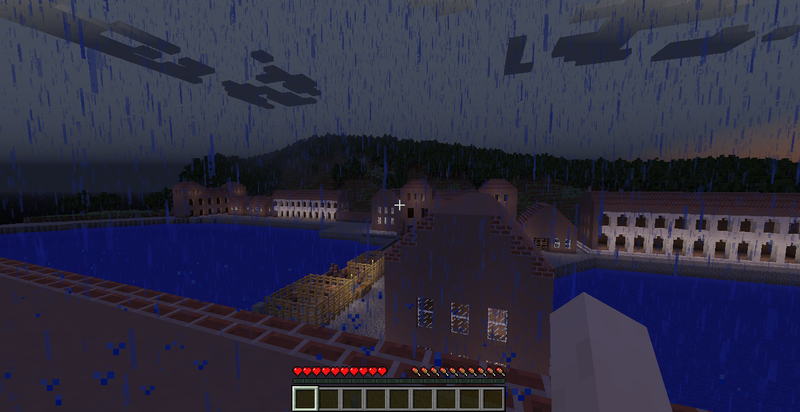 Last week I set up my first Minecraft server. 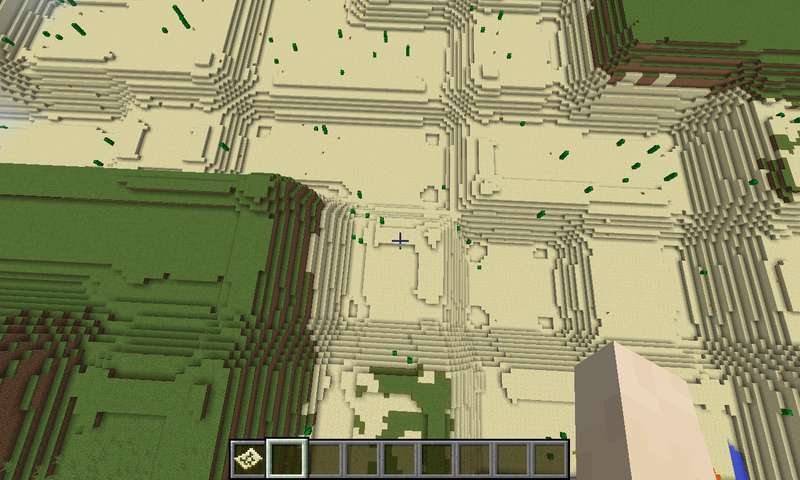 I’d been discussing how we might build Portus on the University’s Minecraft server, but because we don’t yet have Admin access to that I thought I ought to set one up on one of my own machines to start understanding how it all works. I say “one of my own machines” because I had planned to run it from my University Windows laptop, but I could not get it to work. The idea is that you run it once and it creates a bunch of files, which you then fiddle with before running it properly. But those files didn’t appear on my PC. After some time trying to locate them, or run the .exe file again to create them anew, I gave up and decided to repeat the process on my Mac at home. There it all seemed to work perfectly. The only challenge on the Mac is creating a script to actually start the server, and then turning it into an executable file. But there is a very simple guide on how to do this on the Minecraft Wiki. That YouTube Video is a bit out of date you see. and you don’t need to find it from GoogleEarth (or download the SRTM plug-in, which it turns out doesn’t work anymore anyway), the data you need is available here: http://dwtkns.com/srtm/. When we do this for real, we’ll have the Universiy’s LIDAR data to create the topology, but I wanted to have a go with something relevant. So I used QGIS, the free and open source GIS software, to edit the SRTM data down to an area around the sites of ancient Roman Portus and Ostia. 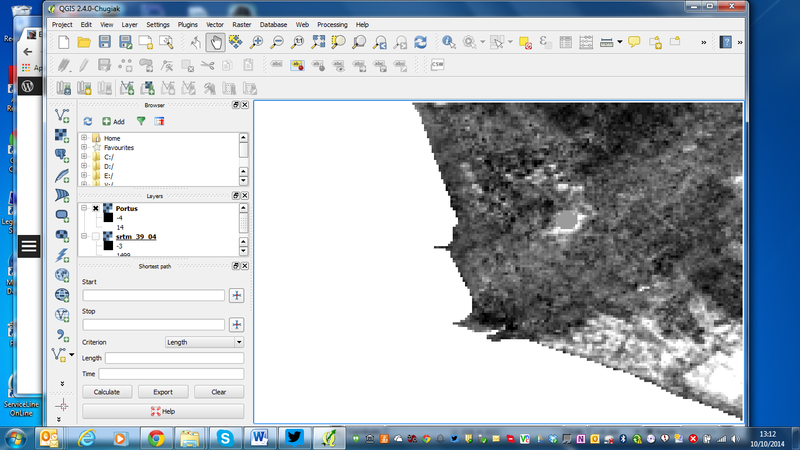 The area around Fiumicino in SRTM TIFF data, manipulated in QGIS. Is that the Trajanic Basin? 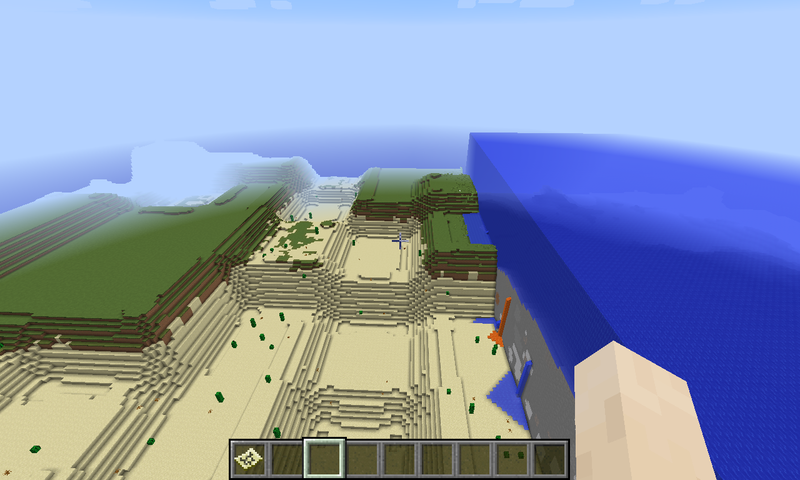 Then, exporting that image as a Bitmap (BMP) file, it was off to WorldPainter, to turn it into a Minecraft world. There’s a bit of trial and error required here, first of all finding an appropriate scale for the translation, both in x and y axes, and of course in height. 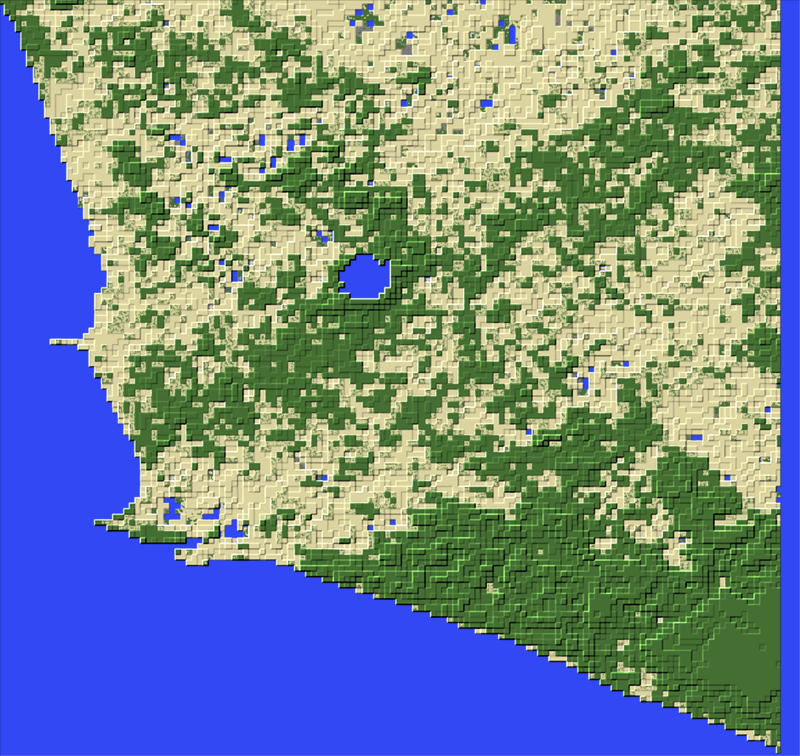 WorldPainter tends to want to make the range between see level and the highest point 255 blocks (which I guess is something to do with the shades of grey in the bitmap. Then there is the white space where the sea goes. White indicates the highest points of the the landscape, so the sea could turn into a massive … er… massif, 255 blocks high. I have NO idea where these huge anti gravity squid ponds came from!